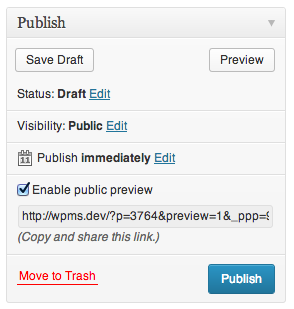 Public Post Preview adds the ability to share a draft post or page with somebody before it is fully published. By default, WordPress will only allow logged in users who already have access to the draft to see the post. This plugin allows wider access to anyone you share the URL with. The generated link will work for up to 48 hours, at which point you will need to generate a new one. Once the plugin is activated on your site, you will see an option for “Enable public preview” on any post or page that is saved as a draft. Check this box and then save the draft again to make it accessible at the provided URL.